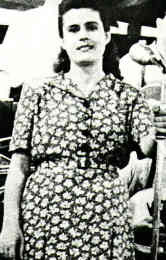 Ioanna Yeorgakopoulou began her singing career before WW2, making her the first of the second generation of women rebetiko singers (the first being that of Roza Eskenazi and Rita Abatzi). Born in Pirgo, Ilia, Greece, she came as a young girl with her family to Athens. Her musical mentor was the composer Yannis Vellas, who prepared her as a singer of European-style 'light' popular songs. However, Ioanna quickly came to excel in her interpretations of other genres - Smyrnaika, dimotika,and especially, rebetika. She began recording on 78 r.p.m. around 1938 at Columbia's Athenian recording studio,and went on to make scores of discs after the studio, shut down and looted by German occupation forces in 1941,was re-established in 1946. She has probably recorded more classic tracks for more composers than any other rebetissa - Panayotis Toundas, Dimitrios Semsis,Stelios Keromitis, Bayanderas, Yannis Papaioannou, Yorgos Mitsakis,Yorgos Lafkas, Vasilis Tsitsanis, Manolis Hiotis and many others. She also wrote a number of her own songs, including many that are well known but attributed to others. Many regard Ioanna's as the best female rebetiko voice ever, but, despite her prolific recording output and long performance career, she never gained the legendary status of Sotiria Bellou. A relatively private person, she had two daughters and several grandchildren. Ioanna passed away 10 August 2007.